Thyroid eye disease (TED) is an autoimmune inflammatory disease of the eye and surrounding tissues. It is also recognized in the literature as Graves' ophthalmopathy, Graves' orbitopathy, thyroid-associated ophthalmopathy, and thyroid orbitopathy. TED was originally associated strictly with the Graves' triad of hyperthyroidism, pretibial myxedema, and eye disease. More recently, TED has also been noted in Hashimoto's thyroiditis as well as in the absence of a thyroid dysfunction. While symptoms are typically bilateral, they are often asymmetric. The most common presenting signs are orbital and periorbital edema, eyelid retraction, eyelid lag in downgaze, restrictive strabismus, compressive optic neuropathy, and exposure keratopathy with common symptoms of ocular irritation and dryness (Figures 1 and 2) . The disease course of TED does not always coincide with thyroid activity or the treatment of underlying thyroid dysfunction. Figures 1 and 2: These patients have some of the classic signs and symptoms of TED. Note the periorbital edema, eyelid retraction, scleral show, and conjunctival injection. TED is the most common cause of orbital disease in North America and Europe and of both unilateral and bilateral exophthalmos. While TED is most commonly associated with Graves' disease, it can also occur in association with other thyroid states, pathologic or non-pathologic. TED has a higher prevalence in women than men (16 per 100,000 vs. 3 per 100,000, respectively). Both men and women demonstrate a bimodal pattern of age of diagnosis (40-44 and 60-64 years in women; 45-49 and 65-69 years in men). The median age of diagnosis is 43 years for all patients, with a range from 8-88 years. Patients diagnosed over the age of 50 years have a worse prognosis overall. Risk factors for TED include age, gender, ethnicity, and family history. A positive family history of TED is noted in 61% of TED patients . TED exacerbation is thought to be associated with both genetic and environmental factors, such as cigarette smoking, low selenium levels, and stress . Smoking has been shown to adversely affect the development, progression, and response to treatment of TED. Smokers are twice as likely to develop Graves' disease, and smokers who have Graves' disease are 7.7 times more likely to develop TED compared to nonsmokers with Graves' disease. 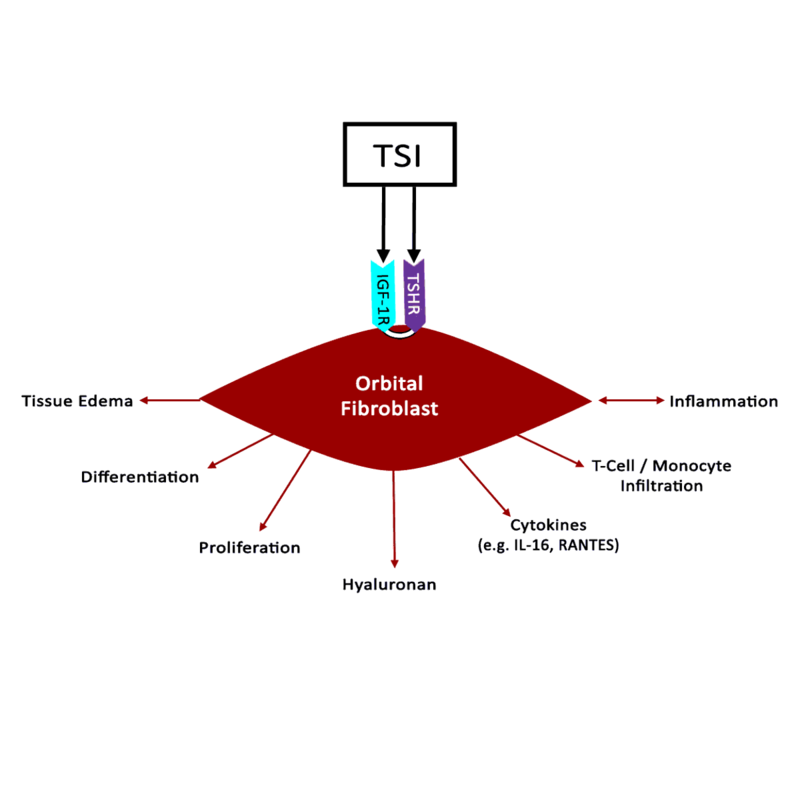 Development of TED is centered on inflammation of orbital tissue via stimulation of orbital fibroblasts (Figure 3). Orbital fibroblasts are unlike other fibroblasts in the body, in that they express CD40 receptors (CD40-R), which are normally found on B-cells . When T-cells interact with CD40-R on orbital fibroblasts, the orbital fibroblasts produce pro-inflammatory cytokines. This leads to the synthesis of glycosaminoglycans (GAGs) and hyaluronic acid. Up-regulation of GAG synthesis and deposition of GAGs results in congestion and edema of orbital tissue (Figure 4). Orbital fibroblasts originate from neural crest cells and can differentiate into adipocytes or myofibroblasts . Fibroblast-to-myofibroblast differentiation explains another variant of TED that manifests primarily with muscle enlargement and more commonly leads to restrictive myopathy . Figure 3: Orbital fibroblast activation. Stimulation of orbital fibroblasts activates pro-inflammatory genes, leading to the synthesis of glycosaminoglycans (GAGs) and hyaluronic acid. Figure 4: Orbital congestion. Up-regulation of GAG production and deposition results in congestion of orbital tissue. Expression of both insulin-like growth factor 1 receptor (IGF-1-R) and thyroid-stimulating hormone receptor (TSH-R) directly correlate with TED . 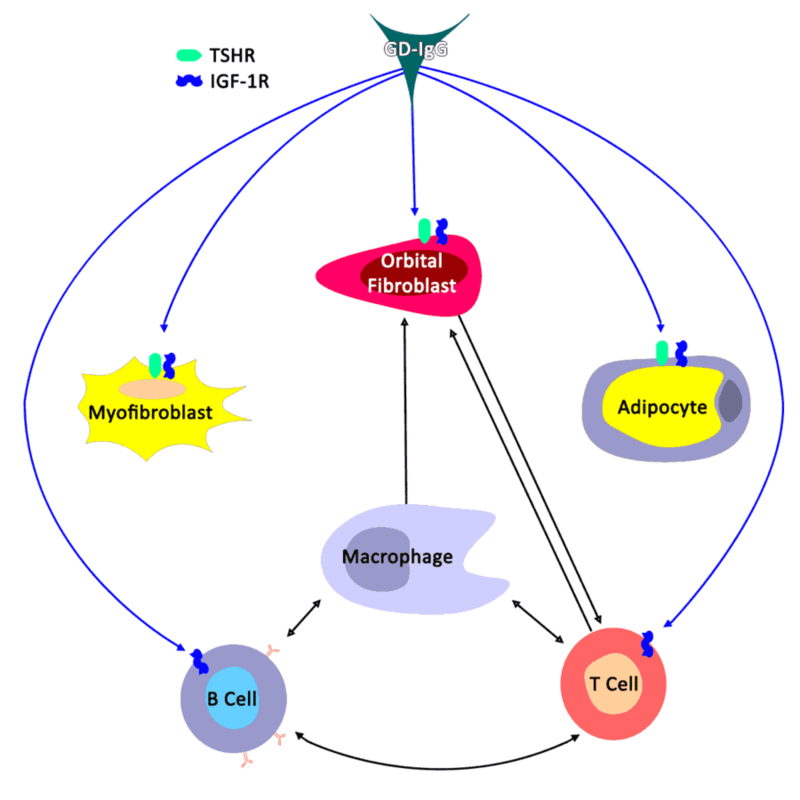 Both IGF-1-R and TSH-R are present on most types of human cells and are activated by their respective autoantibodies. Activation of IGF-1-R stimulates synthesis of GAGs and secretions of chemoattractants by orbital fibroblasts, leading to orbital inflammation and congestion . Activation of IGF-1-R and TSH-R cause orbital cytokine production, leading to GAG deposition in orbital tissues (Figure 5). TSH-R activation upregulates the synthesis of TSH-R mRNA . TSH-R mRNA signals for additional fibroblast differentiation in the orbit. Three types of TSH-R antibodies (TRA) are known, but only one type, thyroid-stimulating immunoglobulin (TSI), is associated with hyperthyroidism and TED . A recent study found TSI levels correlate directly with the activity and severity of TED, and all TED patients with diplopia were positive for TSI. TSI is the closest "functional biomarker" of TED that we have at this time. While the amount of TSI produced is directly correlated with TED severity, TED can present without Graves' disease or autoantibody formation . Figure 5: Antibody interaction. IGF-1-R and TSH-R are activated by TSI (GD-IgG). Activation of these receptors produces orbital cytokines, leading to GAG deposition and orbital inflammation and congestion. Cytokines and chemokines directly activate a cell-mediated response, leading to an infiltration of inflammatory cells in orbital tissue. Monocytes, NK cells, and granulocytes are involved. Many treatments of TED have targeted these immunologic processes.